Difficulties detecting FLS over arid regions using satellite alone. 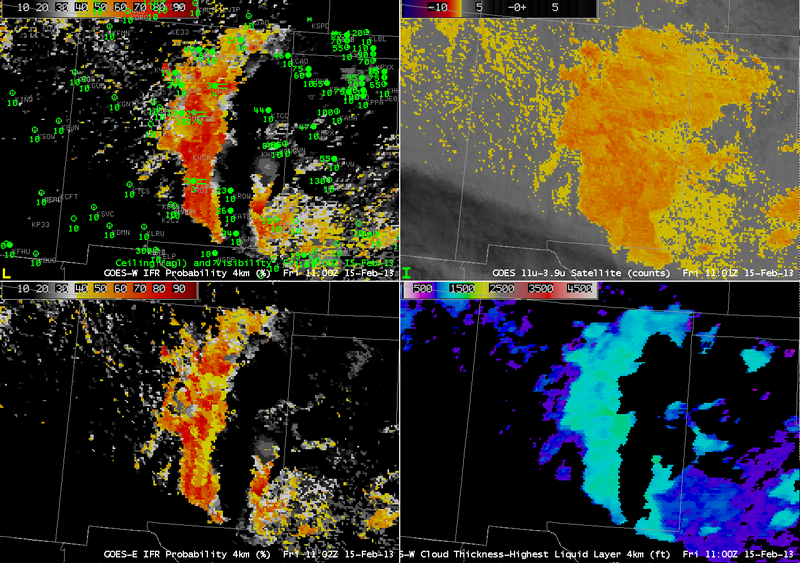 GOES-R IFR probabilities (top left) and the traditional 3.9-11 micron brightness temperature difference (top right) from GOES-West on October 2, 2012 at 13:30 UTC. 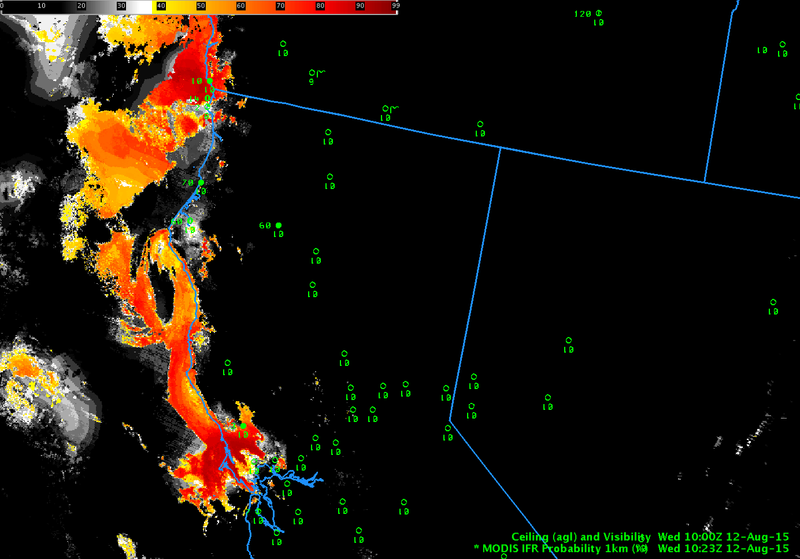 The blue circles are surface observations with the surface visibility (in miles) below. The maximum relative humidity in the lowest 1000ft layer above ground level from the Rapid Refresh forecast model valid at 13:15 UTC on October 2, 2012. The traditional 3.9-11 micron brightness temperature difference (BTD) used to detect liquid stratus clouds exploits the emissivity differences at the 3.9 and 11 micron wavelengths. Liquid water clouds typically emit less at 3.9 microns than at 11 microns and this difference can be used to differentiate them from other types of clouds. This method works well when the liquid stratus clouds are the highest cloud layer and are distinguishable from the background surface characteristics. However, fog/low stratus (FLS) detection over arid regions can be difficult using satellite data alone because the very dry land surface typically has a low surface emissivity at the 3.9 micron wavelength as well, resulting in a satellite signal very similar to that of liquid stratus clouds. This is shown in the top right image above where the arid regions of the SW U.S. have a similar BTD signal as the status clouds offshore California even though all the surface observations in the area indicate no clouds are present. 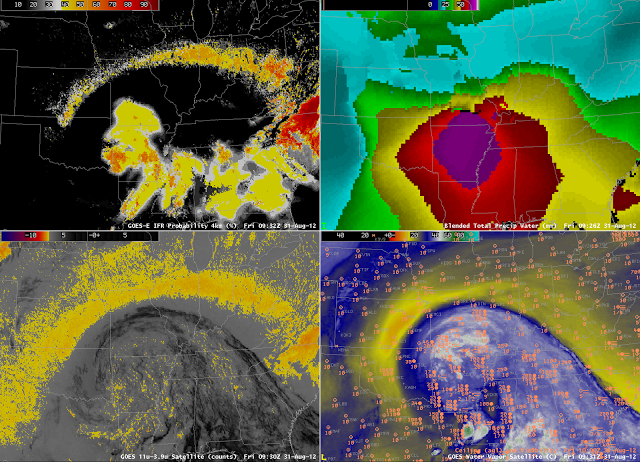 The GOES-R IFR product (top left image above) can greatly reduce the false satellite signal caused by the land surface by incorporating model relative humidity (RH) data. For the GOES-R IFR product the satellite data is combined with the maximum RH found in the lowest 1000 ft layer above ground level from the Rapid Refresh RH profiles using a naive bayesian probabilistic model. FLS generally occurs when the low-level RH is relatively high (> 80%). The low level RH in arid regions is usually very low (< 30%), so even when the satellite signal is strong, indicating FLS may be present, the weak model signal works to lower the probability that FLS is present. However, sometimes the low-level RH can be elevated over dry land surfaces when clouds are not present. When this occurs, the relatively high model signal along with the relatively high satellite signal (from the land surface) indicate there is a greater chance that FLS may be present so the GOES-R IFR probabilities are slightly elevated. This is shown in the top left image above where an area of elevated GOES-R IFR probabilities in central California indicate that there is a roughly 40% chance that IFR conditions are present even though the surface stations report clear skies. 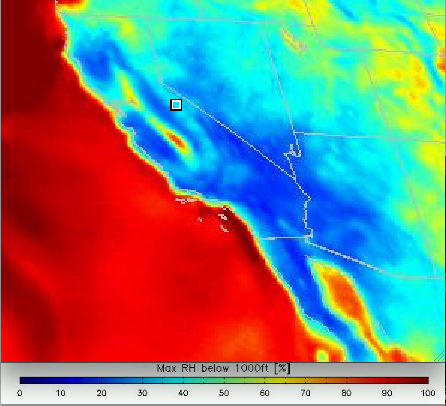 The low-level modeled RH from the Rapid Refresh model (bottom image above) indicates a sliver of elevated RH (> 80%) in central California. This area of elevated low-level RH combined with the relatively higher satellite signal (from the land surface) resulted in the GOES-R IFR probabilities being slightly elevated. GOES-R IFR probabilities around 40% are considered to be relatively low and, combined with the surrounding surface observations, forecasters should feel pretty confident that this is indeed a false signal and that FLS is not present. GOES-R IFR probabilities (left) and the traditional 11-3.9 micron brightness temperature difference (right) from MODIS on October 2, 2012 at 9:05 UTC. 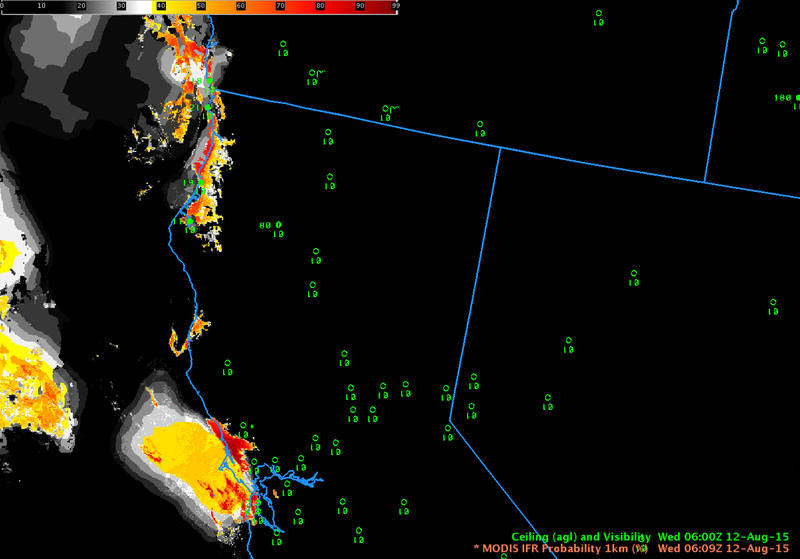 The blue circles are surface observations with the surface visibility (in miles) below. The higher spatial resolution (1 km) MODIS instrument shows in more detail the elevated traditional BTD satellite signal caused by the arid land surface (right image) over the SW U.S. The GOES-R IFR probabilities applied to MODIS (left image) again show how the GOES-R IFR product significantly reduces the false FLS signal that is seen in the traditional BTD product. This entry was posted in Emissivity, MODIS, Rocky Mountains on October 2, 2012 by Scott Lindstrom.